Terra Bella Landscaping can help you and your family relax this year by redesigning your favorite outside space, adding both beauty and comfort. Taking your vision from our design table, through construction, to the completion of your beautiful new space is our passion. Terra Bella Landscaping can build the perfect deck, arbor, or pergola for your outside area. Unique, beautiful, and functional… Terra Bella Landscaping has been building patios, walkways, and walls for over 16 years. 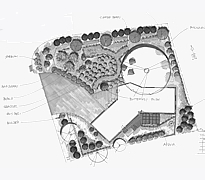 Increase usable space & improve landscape drainage. Call us today for a free estimate! Let Terra Bella Landscaping help make your home stand out! Increase the value of your investment AND the compliments from your neighbors. 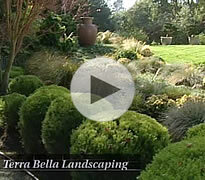 Terra Bella Landscaping continues to be recognized as one of the top Santa Cruz landscape companies. The creation and implementation of beautiful and romantic gardens is our primary purpose. In the course of building gardens, we utilize low water use principles, add functional features such as BBQs and pergolas, and try to meet peoples need for a restful and entertaining garden. We offer sustainable landscaping unique to your lifestyle you will cherish for life with water savings and improved views. Winning numerous awards in water features, lighting, xeriscape, and custom residential and commercial design has set us apart from other Santa Cruz Landscape Companies. Featured in the November 2004 issue of Sunset Magazine.